After forming a head-and-shoulders top (more obvious on intraday charts), BTC has dropped down to test the 50 day moving average from above (blue). 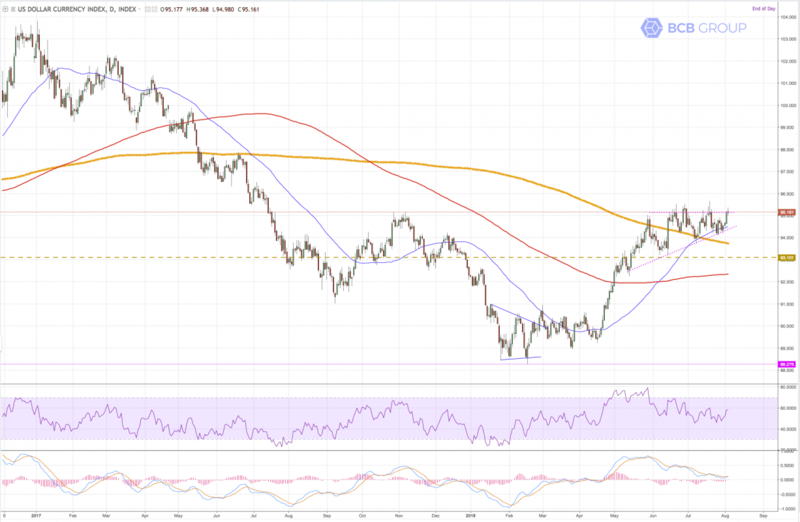 Last week saw an MACD (the lower oscillator under the chart) bear-cross showing momentum swinging lower; with RSI also down at the 40 level we are clearly back in bear territory again. 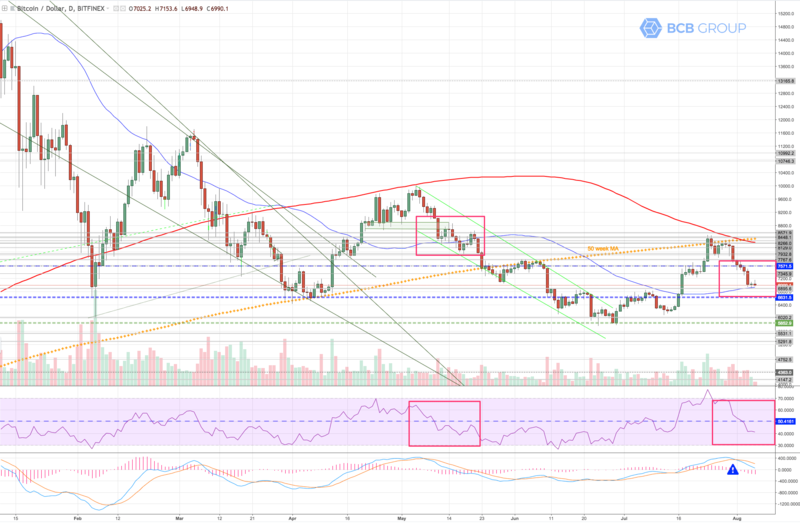 This picture is almost a photocopy of May’s action, as shown by the red boxes – impulse move downward followed by spinning top/doji pause on the 50 day MA, and almost identical MACD and RSI. Short-term bulls’ best hope would be if the volume picture were to be different this time, but we’re not seeing that yet – bears are clearly in charge, and the low volume on the penultimate doji candle shows a bottom isn’t in sight yet. Directly below us is very strong support at $6630 which I expect we’ll probably see tested this week. If that fails $5852 will come into play. All of this doesn’t bode well for the alts short-term (or possibly bodes very well for bargain hunters with a longer-term perspective). 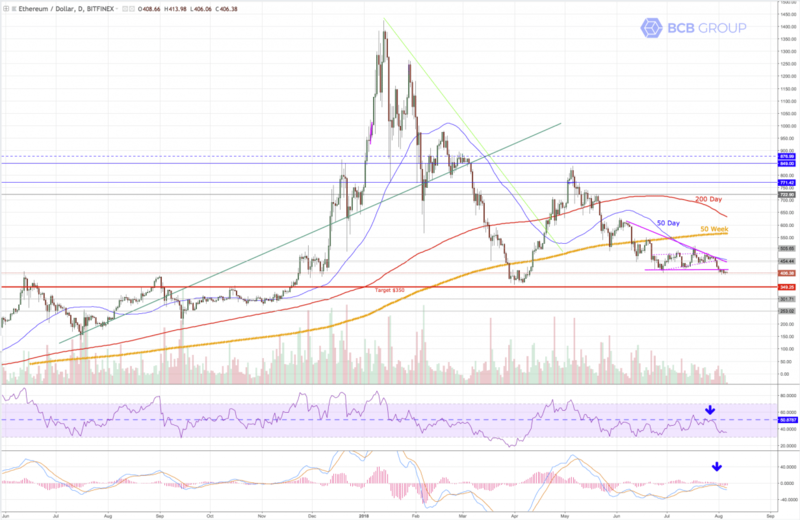 The last few weeks have seen ETH forming a bearish ascending wedge (pink dotted) rising up to the underside of the 50 day moving average. This has now resolved into a move lower. I’m superimposing a descending pink triangle (sloping roof, flat base) on the action; while there isn’t much of a case for the flat base on the ETH chart, there is on other alts and I think the sentiments tends to aggregate, so this is relevant. Flat bottomed triangles are most frequently bearish continuation formations – pressure builds from above until the price pops out of the flat bottom (support). We are slightly below that support here, I expect an acceleration lower should the other alts break out downwards. Target is $350 (shown in red). Here the bearish descending triangle (shown in pink) is much clearer. MACD has just crossed bearish, RSI is bearish. Target on a break of the flat bottom of the triangle is a non-dramatic $65. Similar bearish MACD and RSI picture. 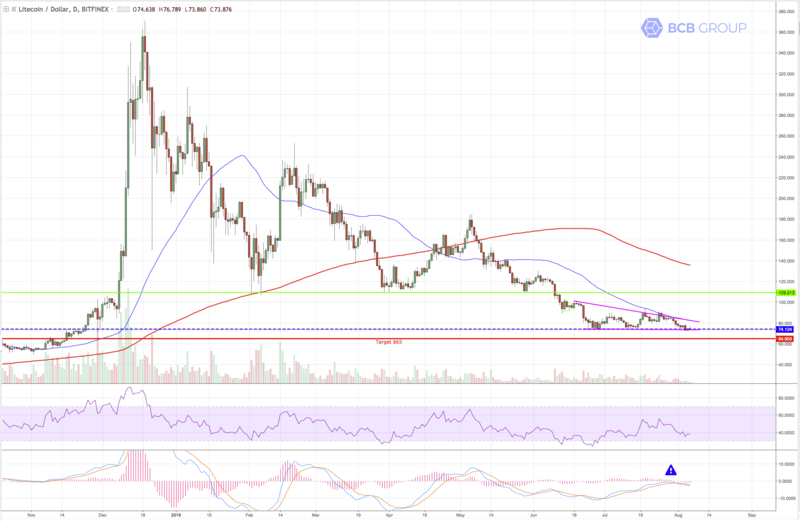 I’m still expecting some fireworks on XRP if/when it breaks the support from the bottom of the triangle – with a target of $0.27. I’m including a DXY chart today, showing the US dollar against a basket of other currencies. The reason is that the dollar has formed a bullish ascending triangle (pink dotted). This is the bullish polar opposite of the altcoin descending bear triangles; a breakout upwards from this formation on the dollar could easily cause the altcoins to break support (since we are measuring them vs the USD). 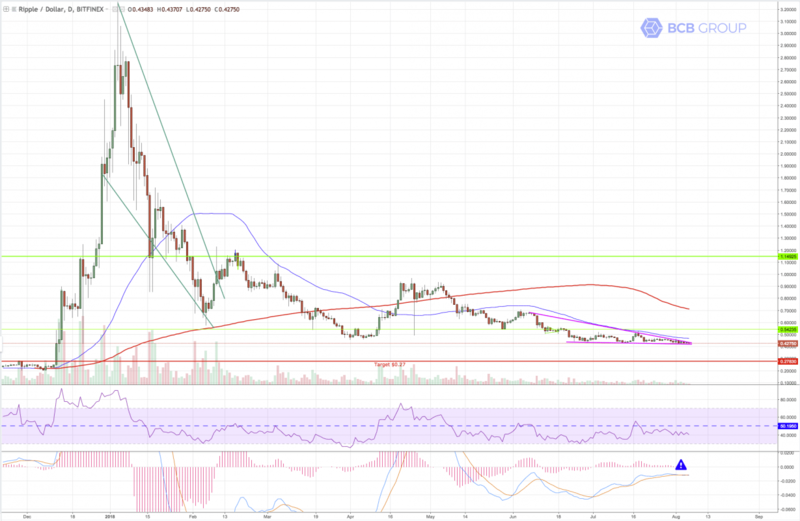 With MACD nearing the zero line which tends to act as support, and talk of the Fed raising interest rates twice more this year, this is ripe for a breakout upwards and short-term is potentially bearish for crypto. So in summary, I think we may be about to finally see our capitulation move lower, possibly giving long-term investors some really juicy buy points.